Brand new and high quality high back chair cushion, which is made from superior PP cotton. The cotton is carefully stitched so that would not leak out. It must be comfortable to sit on hard chairs in cold winter, so it is your ideal choice to buy a soft and warm cushion. This cushion could also be used as decoration for its beautiful color. You could apply it on outdoor bench or indoor chair because the angle could be freely adjusted to adapt the chair. Don't hesitate to buy one! Dimension: 44" x 22" x 5"
Multi Purposes: This cushion could be used in a various of environment. It could be tied on even chairs or chairs have angles. You could also just place it on floor for quick resting. Comfortable Cushion: 100% polyester(Suede fabric) make the cushion much more comfortable and soft than kindred items. Plus, it is not easy to even out or be out of shape for the special material. Last Long Using: Overstuffed construction for extra comfort and longevity.With 500g PP cotton in per square for extra comfort and longevity, this cushion's elasticity is better than kindred cushions. 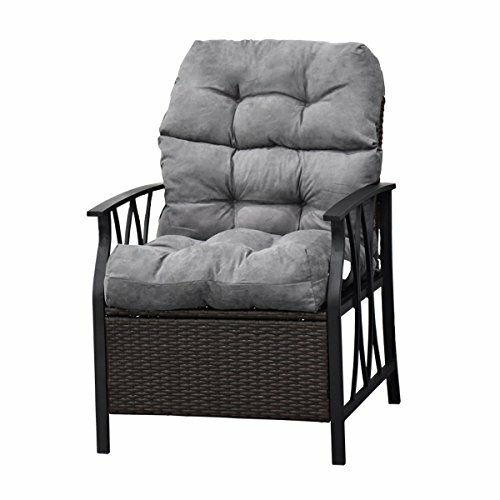 Three-Fold Design: Feature with three-fold design and the cushion features with four ties for secure fastening to a chair. The ties are of great quality so that is not easy to broken. No Leak-out Design: For exquisite sewing technology, this cushion would not leak out. And for the square sewing, the elasticity would be better.